In our experience, some managers can be great leaders, and conversely, some leaders can be great managers. Occasionally, one can excel in both roles, but this is the exception. In the US Army, managers are staff officers and leaders are commanders. What is the difference? Leadership is an art, and is all about setting new strategic direction and leading a team to get there. The leader is one who inspires and rallies the team around a common cause with shared values and a culture of excellence to achieve a desired end-state. In the US Army, the stage is the battlefield where results are never preordained and lives are at stake. In business, the desired end-state might be a major change in direction, to include a new business opportunity, an acquisition, or culture change. Both Jim Collins and John C. Maxwell developed leadership models with five levels — Level Five being the pinnacle. Collins’ Level Five leader is one who builds enduring greatness with a paradoxical combination of personal humility and professional will. Maxwell’s Level Five is designated “personhood” and is attained through a lifetime of proven leadership. People follow these leaders because of who they are and what they represent. In both models, values-based leadership is at the heart of the matter. 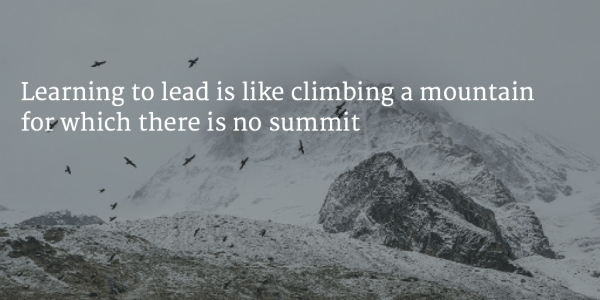 Most people never attain Level Five status, it is a climb where there is no summit. Management, also critical to the success of an organization, is all about directing people and resources according to principles and values that have already been established. It is the arrangement of resources in space and time to be both effective and efficient. Successful organizations must have competent managers to translate the leader’s direction to action and direct their respective teams based on established norms and procedures. The best managers require leadership skills, a high degree of self-discipline, and a creative streak to fuel continuous improvement. In the US Army, the system seeks to identify and promote officers with the most potential into higher levels of command who excel at leading soldiers and perform well in management roles. The process to identify the leaders with the most potential includes measuring performance in tough and sequential management or staff assignments. This ensures that leaders have an appreciation for what it takes to direct people and teams within the context of changing strategic direction in complex environments. With the understanding that growing leaders is a journey, where do you and your organization stand? Do your leaders personify the Level Five characteristics of Collins and Maxwell? If not, where are they on the journey? What will it take to get them to the next level? Do your managers have the skills necessary to control and direct day to day operations based on established norms and procedures? Are your managers capable of providing their respective teams the leadership required to win? Much of the answer depends on whether or not you and your team acknowledge that leaders are developed over considerable time. Does your organization resource leader development programs? Does your organization employ a talent planning system? Do you certify your leaders? Do you promote from within? Is your voluntary turnover rate less than industry average? Do people stand in line to join your culture? The answers to these questions are really important to the future of your company. There is a difference between leaders and managers. Every organization requires both. Some people excel in both roles, but this is the exception. We’ve asked lots of questions. Let’s roll up our sleeves and get to work!